Katie Hill has the bold vision and bravery to stand up to big money and save our democracy. In Congress, she'll vote to overturn Citizens United, get money out by supporting publicly funded elections, and make our tax system work for all, not just the wealthy few. 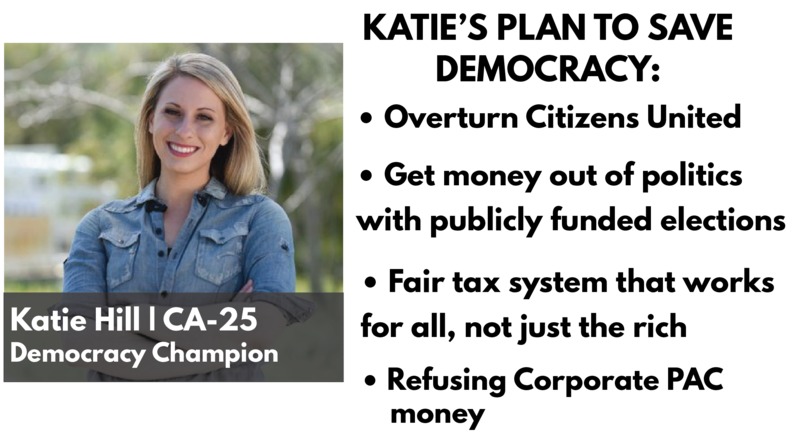 She's running to replace Rep. Steve Knight, who sold his voters out to his donors by passing the GOP Tax Scam. As a reward, Sheldon Adelson and big super PACs are spending millions to buy his election! Help send Katie to Congress to pass the reforms we need and save our democracy!